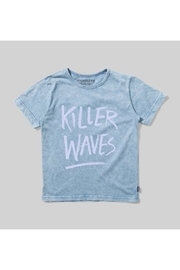 Rad acid washed graphic tee from Munster Kids- 'Special Issue Garments for Breaking Stones and Painting Bones'. Allover acid wash on top of a carribean blue body, white screen printed Killer Waves graphic across the chest. Finished hems, plain back. Munster tag on right bottom seam. Tagless interior to prevent any irritation, and made out of 100% Cotton for extreme wickability! Care Instructions: Machine wash cold, do not bleach. Do not tumble dry, do not wring, do not iron print.